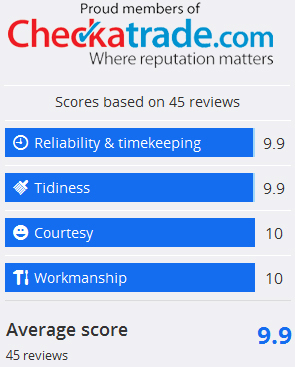 Here is a selection of our clients responses to our work which has been taken from Checkatrade's website. If you would like to view these on Chackatrade please "Click Here" to check our Checkatrade webpage. Roof repairs - “Mike and his team were brilliant and have done an excellent job. He explained everything and the repairs were done carefully. I would thoroughly recommend him.” – Customer in Reading, 8 May 2015. Gutter repair - “This is the second time I've used MJS only a small job this time but Michael still put as much effort in as a much bigger job. He is very punctual, polite and a good hard worker. Nothing is to much trouble for him, I wouldn't use anyone else for future work highly recommended.” – Customer in Wokingham, 4 May 2015. New felt, new batters, new valleys, tiles, cement work - “Excellent, friendly, proper in all respects.” – Customer in Wokingham, 23 April 2015. Exterior painting - “Professional, polite and reliable.” – Customer in Sandhurst, 14 April 2015. New flat roof and repair serrate roof - “I would recommend this company.” – Customer in Wokingham, 14 April 2015. Roof work - “Very efficient service got on with the job . Great guys.” – Customer in Bognor Regis, 10 April 2015. New facia and new guttering - “I would recommend them, very good work.” – Repeat Customer in Henley-on-Thames, 24 February 2015. Roofing - “Quick and efficient work, up front about all cost and work carried out, a great group of lads.” – Customer in Newbury, 16 February 2015. Parapet wall - “Have used this them twice, been efficient and courteous both times, clear about what they did and gone beyond what was needed. Excellent.”” – Repeat Customer in Reading, 20 January 2015.